Is a FAA Commercial Single Engine, Multi-engine rated pilot. He holds a FAA Certified Flight Instructor-Instrument rating, (CFI, CFI-I), as well as a FAA Ground Instructor Certification. Robert also holds an FAA Airframe and Powerplant Maintenance Technician Certification. He also holds an Inspection Authorization rating. He is also certificated as a sUAS pilot. With over 10,000 flight hours, primarily earned in the capacity of flight training, Robert's main focus is to train safety through knowledge. He truly enjoys bringing your dream of becoming a pilot to fruition. 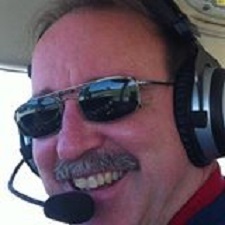 Robert holds a FAA Certified Aircraft Dispatch License and has worked in the flight operations of several major airlines such as TWA, American Airlines, Atlantic Southwest Airlines and Kitty Hawk Air Cargo. As a Dispatch Officer in flight operations he managed international and domestic commercial flights and coordinated traffic routing with the Air Traffic Control command center. Robert served proudly in the U.S. Air Force Reserve with the rank of Staff Sergeant in the Weapons System Security Forces. He attended Embry-Riddle Aeronautical University in Carswell Joint Reserve Base in Fort Worth, and the University of Wisconsin, Milwaukee. Robert has flown to many interesting locations in the United states, including the Hawaiian Islands. There he had the opportunity to fly the islands, view a pod of whales, WWII shipwrecks and the Jurassic Park movie set. He has also flown the mountains in Colorado, landing at Teluride and Leadville, the highest altitude airport in North America. . Other interesting flights include flying past the Gateway Arch in St. Louis, Mount Rushmore, and Devils Tower. Landing at Meigs Field on the Chicago lakeshore on his way to Oshkosh for the nations largest airshow is also noteworthy. He is a member of the Airplane Owners and Pilots Association (AOPA) and the National Association of Flight Instructors, (NAFI) and Experimental Aircraft Association (EAA). I have taken the best practices and applications from my flight training experience and developed a program which is knowledge based, flexible and affordable while maintaining the highest standards. You will find your training to be highly personalized, always working one on one with you individually. I look forward to starting you on a solid flight training foundation, whether you fly for a career, personal transportation, or just for aviation fun.